AUSTIN, Texas, Feb. 8 (SEND2PRESS NEWSWIRE) — Dawn Westerberg Consulting LLC (www.dawnwesterberg.com), an integrated marketing and public relations services firm based in Austin, Texas, was selected by JMT Consulting Group to develop and present a webcast on social media for the firm’s customers and prospects. The webcast, entitled “Taking the Fear and Hype Out of Social Media: Advice for Nonprofits,” is the first presentation of its kind offered by JMT Consulting, which is a national provider of consulting and software solutions to nonprofits. – examples of nonprofits successfully using social media. For nonprofits interested in attending the webcast, a registration page can be viewed at: http://www.jmtconsulting.com/resources/events/taking-the-fear-and-the-hype-out-of-social-media-advice-for-nonprofits . Headquartered in Patterson, New York, JMT Consulting Group (www.jmtconsulting.com) is a leading provider of software and consulting services to nonprofits. Based in Austin, Texas, Dawn Westerberg Consulting LLC serves companies from coast to coast and border to border. 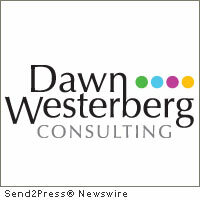 Dawn Westerberg (http://dawnwesterberg.com) is the president of Dawn Westerberg Consulting LLC. An Authorized Duct Tape Marketing Consultant, she invites business owners to “Fall in Love with Your Business Again” through sound marketing strategy, creative collaboration and inspired performance.